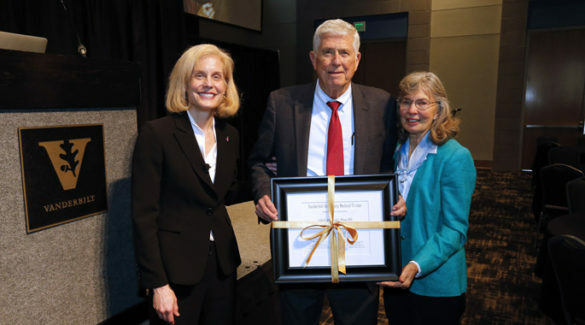 The initiation of the fund, which will support the next generation of physicians, scientists and scholars, was announced during a daylong research symposium held Oct. 11 at the Vanderbilt Student Life Center to honor Moses’ personal and career accomplishments, and to acknowledge the contributions of his wife, Linda. Moses, a past chair of the Department of Cell Biology (now Cell and Developmental Biology) and founding director of the Vanderbilt-Ingram Cancer Center (VICC), recently moved to emeritus status as a Vanderbilt faculty member and administrator. Nearly every branch of cancer research has been influenced by this knowledge about the role of TGF-beta in human cancers and new research continues to build on this groundbreaking discovery. Moses gained international renown for his discoveries and served in national leadership roles as president of the American Association for Cancer Research (AACR) and the Association of American Cancer Institutes (AACI). Moses has been honored with numerous awards including the AACR Lifetime Achievement in Cancer Research Award, the T.J. Martell Foundation Lifetime Scientific Achievement Award, the Grant W. Liddle Award for Promoting an Interest in Research Among Physicians, and the Vanderbilt University Earl Sutherland Prize for Achievement in Research. He is a National Associate of the National Research Council of the National Academies, a member of the National Academy of Medicine, a Fellow of the National Academy of Inventors and a Fellow of the AACR Inaugural Group. During the research symposium, “TGF-beta: Discovery to Translation,” an array of guest speakers from around the country who worked alongside Moses during his career or whose own research was influenced by Moses’ findings, described the importance of his role in their lives. Moses received his medical degree from Vanderbilt University School of Medicine and spent much of his early career at the Mayo Clinic Cancer Center in Rochester, Minnesota, before returning to VUMC. Robert Coffey Jr., M.D., Ingram Professor of Cancer Research, worked in Moses’ Mayo Clinic research laboratory before following him to VUMC, where R. Daniel Beauchamp, M.D., John Clinton Foshee Distinguished Professor in Surgery, joined the team. Both eventually opened their own VUMC research laboratories. Current VICC director Jennifer Pietenpol, Ph.D., met Moses’s daughter during college, and when Pietenpol told the elder Moses that she was interested in science he arranged for her to work in a Mayo Clinic research lab, then recruited her to the Cell Biology graduate program, where she did thesis research in his laboratory at VUMC, and continued to mentor her for many years. Eventually Pietenpol, who is now the Benjamin F. Byrd Jr. Professor of Oncology, opened her own research laboratory and succeeded Moses as director of VICC when he championed her for the role. Rosa Serra, Ph.D., professor of Cell, Developmental and Integrative Biology at the University of Alabama Birmingham, and Neil Bhowmick, Ph.D., professor of Medicine at Cedars-Sinai Medical Center, Los Angeles, California, who trained in the Moses lab, lauded him for teaching them mentoring and leadership skills. Other speakers included Edward Leof, Ph.D., Erivan K. Haub Family Professor of Cancer Research, Mayo Clinic Cancer Center, and Sanford Markowitz, M.D., Ph.D., Distinguished University Professor at Case Western Reserve University, Cleveland, Ohio. At the conclusion of the symposium, Moses reflected on his research career and the people he has met, influenced and mentored along the way. “I am proud of the success of the people who trained in my lab,” Moses said. He also recounted the early questions about biological processes he was trying to answer when he began his laboratory studies in the 1970s. He was studying chemically transformed cells and didn’t understand why some of those cells didn’t need growth factors. He wondered if they were producing their own growth factors, leading to his initial discovery about TGF-beta. Soon, Moses and his colleagues were collaborating with private industry to obtain a steady source of TGF-beta for research. They also recognized the need for transgenic mice to expand their studies outside of cell lines in a petri dish, leading to the development of new mouse models. Moses said those early findings paved the way for current biological research and have led to the identification of 38 organic molecules known as ligands, 12 cell receptors, 10 SMAD signaling molecules and the development of 70 new mouse models. Moses also noted with pride that there are now more than 80,000 research papers that reference the TGF-beta family. For questions about the new Linda and Harold L. Moses Career Development Fund contact VUMCGiftDonorServices@vanderbilt.edu.